This is our current line up of bags waiting to be tested on our next trip. Not so long ago we took a two week holiday to the tropics taking carry on luggage only. Mainly because I am obsessed with the concept, but also because of the obvious benefits. At the time our children were 3 and 5 years old. Here are five tips if you’d like to do the same. Like so much in life, preparation is key. I’m yet to score a perfect ten in my packing, but these tips are how I plan on getting closer. Try your hardest to do a ‘rehearsal pack’ several days in advance of leaving. Ideally you want to leave enough time to wash and dry something you’ve forgotten about. It also allows you an opportunity to edit what you think you need. This will more than likely happen as you attempt to fit everything in your chosen bags. You will need to be brutally honest with yourself about what you need. I often foolishly pack glamourous items, like everything I need for the perfect smokey eye make up, including false lashes (?! ), with the dream we will be going somewhere suitable. With two preschoolers in tow? Pretty bloody unlikely. Also ask yourself whether you can easily buy some stuff when you get there. The internet is a wonderful place for finding the answer to this, check forums, blogs, you know the drill. Another option is calling the place where you’re staying. Always remember to weigh and measure each and every one of your fully packed bags. Bags that fit the regulations empty may not do so when full to the brim. It sounds like overkill, but you’ve already gone to this much bother, may as well make sure you get across the line. I take it one step further and pack a luggage scale for the trip. I usually don’t allow myself enough time to see if the set-up truly works and that’s a bad idea. Working out how you are going to carry all that gear through the airport, up stairs on public transport etc. will save you a lot of hassle. And physically carrying your bags will encourage you to streamline. Another tip I read somewhere, that I’m tempted to try, is purchasing a couple of outfits for each traveller at the destination and then posting them home at the end of the trip. I guess it could also be used for kids Christmas present if visiting family for Christmas. 2. Lists are just a tool. Sometimes I make lists, but that is mostly to get the items sorted in my mind. At the time of the ‘rehersal pack,’ try as much as possible to lay absolutely everything you plan on taking on your bed or the living room floor. Try and think about what you will be doing on a daily basis and also your ordinary daily routine. As you walk through your imaginary day, check that you have what you need laid out in front of you. And I mean everything you need. If you charge your phone before bed at night, lay the charger and phone on the bed. I find this is better than looking at a list of words. It can be useful after the ‘rehearsal pack’ to write everything you finally decide on taking. I also like to do this visually and take pictures with my phone. Yes, it’s true, this ‘rehersal pack’ business can take up a lot of time. So can waiting at the luggage carousel, or worse, waiting for lost luggage. Ugh. For me, waiting by the carousel, trying to entertain two tired kids is a far worse prospect than spending time editing what we bring. 3. Laundry day will happen on holiday too. 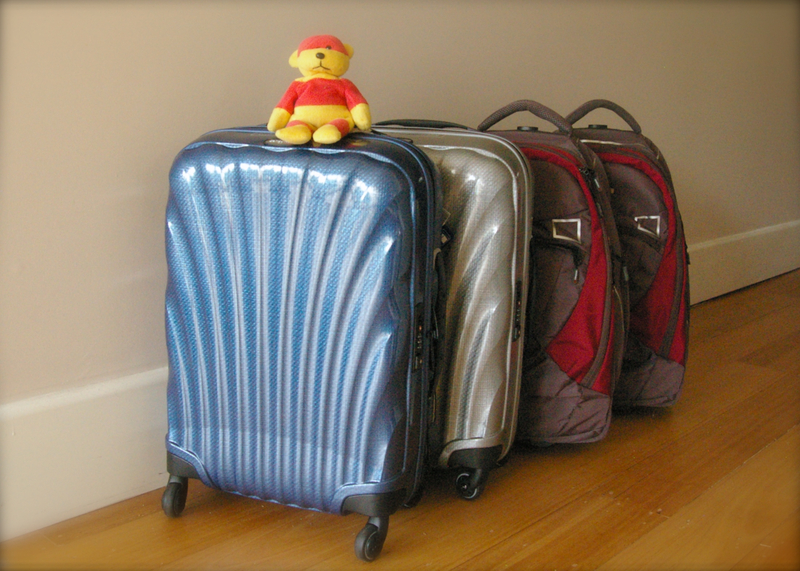 Four carry-on bags will not hold enough clothes for a trip longer than a few days without washing. Often it’s desirable to stay in serviced apartments when you have a family, and one of the reasons is because they often have laundry facilities easily accessible. Even if you will have access to a dryer, I still advise bringing a travel clothesline and maybe some inflatable hangers. You may not want to wait for the dryer to finish, or if you’re like me, you will have foolishly brought several items that can’t go in the dryer. Most hotels can get your laundry done for you too, but it can be costly. If you don’t have access to laundry facilities, then you’ll be doing a lot of hand washing. I am a strong proponent of carry-on only traveling, but I don’t want to spend my holiday working part-time as a washer lady. No easy access to laundry facilities could be a deal-breaker for me. 4. Toiletries are my achilles heel. The most difficult thing for me to edit was toiletries and makeup. Many people say shoes, but I usually only wear one or two pairs in my everyday life, so that’s what I take on holiday. Sometimes, like I said above, I do some ‘aspirational packing’, and throw in some high heels, in the hope they will come in handy. Usually they are strappy and actually don’t take much space. My real weakness is beauty products. There are two issues to remember here. Firstly, you are restricted by the regulations on the size of liquids and, secondly, beauty products are surprisingly dense. This means that even though you may fit it all in your ziplock sandwich bag, that little bag is going to weigh a bit. Lets do some maths. Your liquids bag is about 1 litre. One litre of water weighs 1 kg. Add that 1 kg to 2.5 kg for a light weight carry-on suitcase and you’ve already used up half your allowance (3.5 kg is half of 7 kg). Oh dear. In attempt to comply, I bought numerous small receptacles for my cleanser, moisturiser etc. I also scoured eBay and other online beauty shops for sample sizes of my favourite products. In the end, I also had to have faith that at my destination there were people just as vein as me, and I could buy what I needed/wanted. It’s an issue I’m still working through. Any tips would be greatly appreciated. 5. The Chosen Ones. My thoughts on what type of bags to use. My obsession with beauty products is only rivaled by my obsession with luggage and travel gadgets. Absurdly, I think that if I just have the right stuff, I can just go. This irrational obsession has lead to me giving a lot of thought to what luggage is best. Last time we travelled I think we had it almost right. We took two cabin-sized backpacks with wheels, two trunkis (I review the trunkis here) plus some ‘personal items.’ The backpacks were a great idea. The trunkis were also good, but we probably won’t take them next time. The ‘personal items’ were a bit of a fail. The biggest fail was not completing the ‘rehersal pack’ properly. I should have actually practiced walking up steps with the family, holding hands with the children, and every single piece of luggage, because it actually happened a lot en route to our accommodation. Next time we travel we plan to take the same two backpacks, two four-wheeled cabin-sized suitcases that the boys can push/pull easily and two small cross-body style bags as our ‘personal items.‘ I will also have smaller bags within the larger ones that will contain things we may need during the flight, like kids activities and food. I really hope I remember to pack them so they are easily accessed. I will also note, when you have very young children, like those who need to ride in a pram or the like, the system doesn’t work as well. I once did and didn’t factor in that I needed to push the pram. Duh. Thankfully we had a kind friend in our travel posse that helped us carry the luggage at certain points. Hopefully you found this useful. I’ll be writing more about traveling with carry-on on luggage, because it’s a topic I love. I hope to write a more ‘family-centric’ one that covers more specifically what we took because we had children and to give an idea of how we prioritised and streamlined our packing. There are also some links I found helpful at the end. Please comment about your thoughts on packing. Do you like to travel light, or do you like to save time and just throw it all in? Plus, any packing tips would be greatly appreciated. Lonely Planet article about packing light. Huffington Post article taking carry on only. Lifehacker article about lessons learned from the Hand Luggage Only Project. One Bag website devoted to one bag travelling, full of tips. We are REALLY into hand luggage only…and we have 3 little ones. I buy toiletries airside…they normally have some great offers such as 5 for a set price and all small bottles so you can just use them while you’re away, even the smaller regional airports normally have a chemist selling these so I now pickup all of my shampoos, deodorant, sun lotions etc there. Great post! Thanks for your comment. Buying what you can when you get to your destination is always a great idea. We especially try and do this with bulky items like nappies. I think that’s a really great tip about rehearsing things in your head. I do it the same way. I have my list because in the end I find it’s a good way of double-checking (especially for those emergency items you hope you don’t need – like panadol! ), but I need to edit my list heavily by doing a mental walk-through. I’ve never done carry on with my kids and I’m not about to start soon (maybe when the youngest is more reliable about the toilet training and the eldest is more reliable about not running off?) but in general I approve of light packing and I hope to get there some day. Previous PostPrevious How behaving like an elephant while dressing cute can make airports with kids easier: Three tips on getting through the airport with young children.